Brazo Sign Co. is a licensed sign installation company, meaning we can get your sign installed legally. You must be a licensed sign company like Brazo Sign Co. to install a sign. This is just one of the reasons why our sign install company is the ideal choice. The permitting process can be a huge maze when it comes to getting your sign install. That’s why we have sign professionals that know the ins and outs of getting a sign permit. For example, you must have your sign engineered properly to receive approval for install. 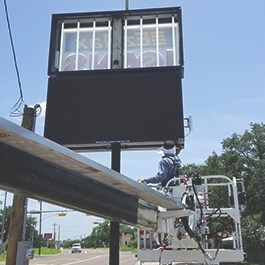 Brazo Sign Co. has done sign installation in Houston and surrounding areas for almost 14 Years. Rely on us for pylon installations, channel letter installations, led installations, monument / freestanding installations, banner installation and much more. 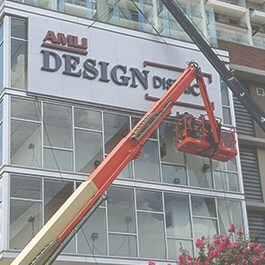 Our sign installation company has installed a variety of signs all across Houston, TX and surrounding areas. With our fleet of trucks, you can be sure the sign install is done at an affordable price and in a timely manner. 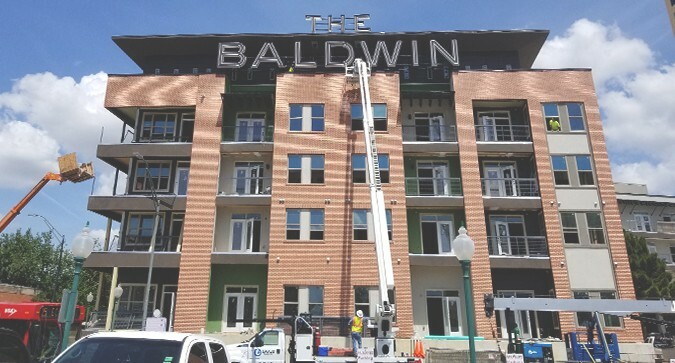 We want to make sure every client is happy with the sign installation process. We pride ourselves in customer satisfaction and aim to keep you updated every step of the way. We want you to know the status of your sign install, we do this by sending you email updates along with completion photos for you approval. With our installation services, we make sure to get the job done quick, safe and in the least disruptive way possible for the client. 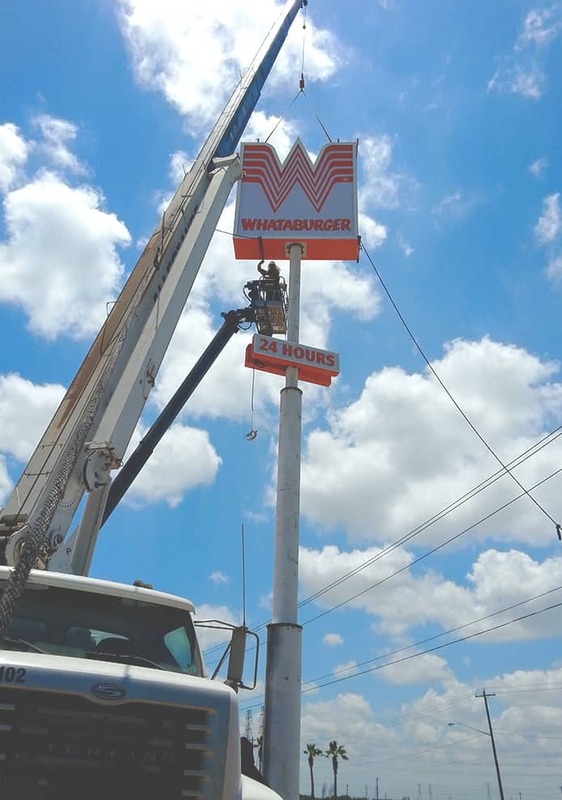 Our sign installation company has installed signs around Houston for around 14 years, meaning you really are dealing with a company that gets the job done right. Choose us as your trustworthy sign installation company and contact us for a quick quote. Pylon sign installations involve hole inspections and a properly engineered sign. We follow the book to get the job done right and in a timely manner. 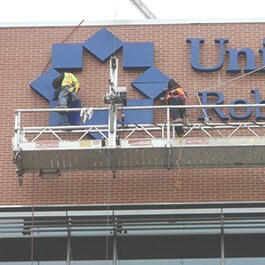 Channel letter sign installations are very common in Houston. They may be our most common sign installation type. Because of this, you can be sure our sign installation company knows their stuff. Monument / freestanding sign installation need to be installed correctly onto an uneven surface. Let our sign installation company be the one to ensure your monument sign is installed properly. 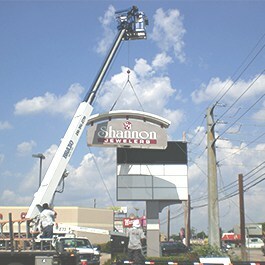 LED sign installations often require cranes to lift the heavy sign. With our fleet of trucks, we can ensure that the job is done fast and for an affordable price. Great group of people to work with. Friendly, professional, knowledgable staff! The Brazo team was a wonderful group to work with. They were on time and produced top notch work. We would recommend Brazo Signs to our clients for their signage fabrication and installation needs. Professional and high quality signs. They do signs for huge clients, but also give just as much time to the small business owners.